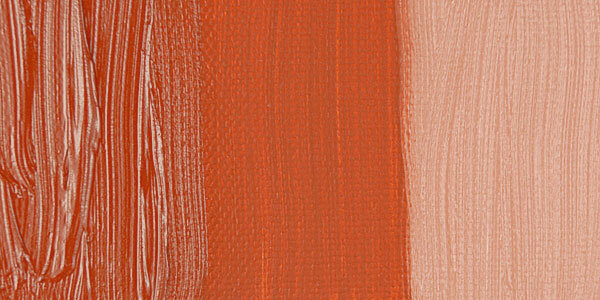 Natural Light Red Iron Oxide is a brick red pigment with a bright, scarlet top tone. Mineral sources vary considerably in both hue and transparency. It is generally opaque and has great tinting strength and hiding power, but more transparent versions are available. It creates salmon pinks when mixed with white. 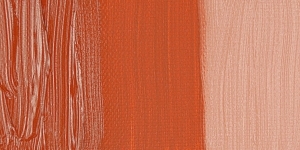 Natural Light Red Iron Oxide is often replaced by Mars colors or bright red oxides, which are cleaner and more powerful. Natural Light Red Iron Oxide has excellent permanence and lightfastness. Natural Light Red Iron Oxide has no significant hazards. Antwerp Red, Bole, Light Red, Colcothar, English Red, Morelle Salt, Persian Red, Persian Gulf Oxide, Poliment, Pompeian Red, Prussian Brown, Prussian Red, Red Iron Oxide, Sinopia, Spanish Red, Turkey Red.